JRBiomedical Ltd is a UK developer, manufacturer and distributor of medical diagnostics including ELISA kits and immunoassay reagents for research and clinical diagnostic use. Our customers include universities, research institutes and NHS laboratories. We also develop and manufacture high quality immunoassay reagents for ELISA under contract for specific pharmaceutical and vaccine applications and distributes the VivaChek range of blood glucose meters in the UK. You can order online, by Email of a purchase order or telephone 01745 535 207. 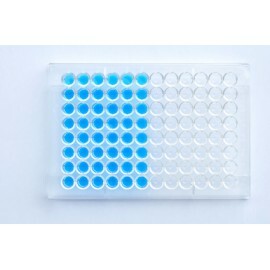 If you can't find the ELISA kit that you are looking for from our online catalogue please use the search box above or call us as new tests are regularly added to our portfolio. With clients including leading pharmaceutical companies we would be pleased to assist you with your contract research and ELISA assay development requirements - just contact us for a quotation and proposal. Find out more about our contract research and ELISA development service today.